5 Axis Machining has traditionally been regarded as advanced technology best suited to the aerospace and automotive industry. 5 axis machining offers many advantages, all of which are now being applied to the mold and die sector. VISI Machining provides the operator with a productive solution for creating highly efficient toolpaths with advanced collision control for the most complex 3D data. Extensive range of CAD interfaces. VISI can work directly with Parasolid, IGES, CATIA, Creo, UG-NX, STEP, Solid Works, Solid Edge, Inventor, ACIS, DXF, DWG, JT Open, STL and VDA files. The extensive range of translators ensures that users can work with data from almost any supplier. For complex 5 axis programming it is often necessary to tweak the geometry so companies working with complex designs will benefit from the simplicity with which their customer's CAD data can be manipulated. Deep cavity / core machining. 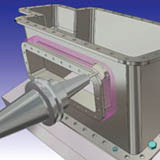 Many complex molds contain deep cavity areas and small radii which need to be machined with small diameter tools. Generally this would involve the use of tool extensions or longer tools which would increase the risk of deflection and provide a poor surface finish. By approaching this from a different angle, the head can be lowered and the collision detection will automatically tilt the tool and holder away from the work piece. The major advantage of this strategy is the use of shorter tools which will increase tool rigidity, reducing vibration and deflection. As a result, a constant chip load and higher cutting speed can be achieved which will ultimately increase tool life and produce a high quality surface finish. 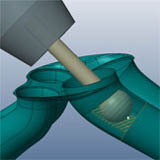 In more shallow areas, larger bull nose cutters can be used with a small lag angle. The major advantage of this approach is a lower number of toolpath passes which also reduces machining time and improves surface finish. Trimming. 5 axis trimming is a common application especially used in the automotive or vacuum forming industry for groove milling or boundary trimming. For this type of strategy, the tool position is calculated normal to the face direction following a drive curve. For additional control, synchronization curves can be used to control the tool movement in local areas. The potential direction changes are at there most extreme when using this type of strategy so the collision detection and toolpath simulation are an invaluable tool. Kinematic simulation. Toolpath verification can be applied using the real machine dimensions and limits with the kinematic simulation including the motion display of all rotational and linear axis. Cutting tool, holders, jigs and fixtures can all be checked when running the kinematic display. 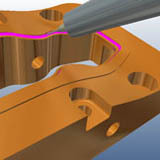 Any gouges on the toolpath against stock, tool or any other part of the machine tool will be graphically highlighted. A comprehensive list of tested 3, 4 and 5 axis machine are available. Hexagon engineers are also available to help with the construction of any bespoke machine.